Noah Smith had a Bloomberg column on the infant industry argument with a nice mention of Reka Juhasz’s paper on the Napoleonic blockade. It’s long been plausibly argued by historians that Napoleon’s attempt to embargo Britain acted as a kind of de facto protection from British competition for cotton industries across Europe. Juhasz’s paper deserves the accolades it has received. It is the first truly rigourous demonstration that temporary protection for a fledgling industry can ‘work’ — work in the sense that a country doing the protection can begin to acquire comparative advantage in that sector, and this has long-lasting effects over many decades. The Juhasz paper overcomes the endogeneity problem in other research about infant industry protection — the nagging feeling that the government might have chosen an industry which would have become competitive anyway without the protection. The blockade was not intended as a commercial policy, and it was more effective in some parts of the French empire than in others. So Juhasz can exploit the geographical variation in blockade efficacy as a proxy for the regional intensity of British competition. That ‘exogenous variation’ part of the paper seems to get the most attention, but for me the most interesting is that agglomeration economies played a key role — the change in the spatial pattern of textile production. Initially, before the blockade, French cotton mills were much more widely dispersed across the country than they would prove to be after the blockade. Juhasz demonstrates that those parts of France least exposed to the smuggling of British cotton were the areas where mechanised textile production took off — production in the south was inhibited by Britain’s first mover advantage, whereas the north was protected. This initial locational advantage persisted long after the blockade through path dependence and self-reinforcing cumulative advantages of agglomeration. It’s that switch in spatial concentration from south to north that makes the paper convincing. I must admit I was sceptical at first. Even in the UK, the first automated Arkwright mills were not tightly concentrated in Lancashire either — they were dispersed across northern England, the Midlands, and Scotland according to water source. I figured this must also be true for France, but Juhasz controls for natural advantages and her findings are intact. But, ironically, water sources or coal deposits were not important partly because, as Juhasz herself notes, “as late as the 1840s, the median cotton spinning firm used no steam-powered machines and one water-powered one according to data from Chanut et al. (2000)”. I say it’s ironic because, as I pointed out on Twitter, the greater persistence of hand-powered machinery in France could be an effect of protectionism itself ! Although France did become an exporter of textiles after 1815, nevertheless French cloth would still not be competitive with British cloth. Perhaps as a result, France banned the import of British textiles (both cotton and wool) until the Cobden-Chevalier Treaty of 1860, after which 20-30% tariffs were imposed. (See Nye 1991.) France did not protect its silk and linen industries, which were already competitive with Britain. 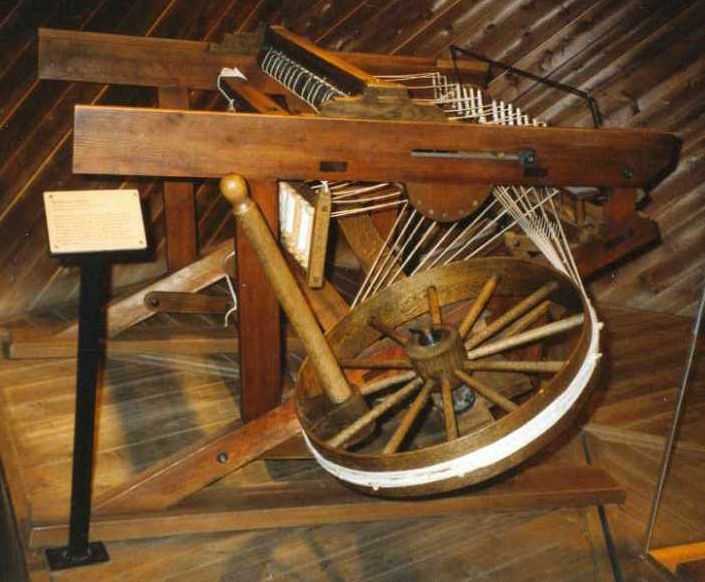 One must remember that the word ‘mechanised’ in the Juhasz paper can refer to the use of multi-spindle jennies or mules which could still be powered by hand. It’s well known that the diffusion of steam power was fairly slow even in Britain, especially in the weaving sector. But in spinning, hand-powered spinning did not persist as long as it would in France. The backwardness of the cotton industry in France circa 1860 is quite striking and the continued protectionism past 1815 must have had something to do with it, even if it is not the full explanation. To be fair, Nye (1987) argues that firm size in France was ‘right’ for French conditions at the time, and he also reminds us that the choice of appropriate technology depends on factor prices. Edit 21-June-2017: I want to add this chart from Marx (! ), Chapter 22 of Capital, volume 1, where he observed very low manning ratios for French spinning factories circa 1866. At any rate you definitely cannot say an effect of the Napoleonic blockade was to make the French cotton industry in 1860 relative to the UK, similar to the Japanese auto industry in 1990 relative to the USA. France could not export cotton textiles to Britain. But even if the French cotton industry was very large, if it was also relatively backward, then the technological externalities might have been fairly limited. It’s also possible that cotton was not that important as a source of knowledge externalities anyway. Technologically it was a dead-end industry — something argued recently by Kelly & Ó Gráda (2016) — and it may have been the beneficiary of linkages created by other industries more than a creator of its own. The cotton industry certainly wasn’t important as a source of demand for educated labour. See Becker, Hornung, & Woessmann (2011). Therefore, for France at least, you must question how much cotton really contributed to “technological upgrading”. I suppose one could argue that a period of continued protection (1815-60) followed by liberalisation (after 1860) was the optimal path. But 1860 is a pretty late date to have been a technological laggard in cotton, the most important industry of the ‘first’ industrial revolution. The ‘second’ Industrial Revolution with steel and chemicals was already approaching in Europe and the United States. A classic critique of the infant industry argument is Baldwin (1969), which is mentioned by Noah Smith in his column. Baldwin mostly addresses the ‘appropriability’ issue — the idea that because entrepreneurs can’t appropriate the full benefits of externalities-generating, increasing-returns production, they will undersupply such socially valuable activities. The gist of Baldwin’s critique is that tariff protection doesn’t necessarily alleviate that problem, and the actual history of French cotton seems consistent with that view. All this also lends support to the political economy critique of the infant industry argument, i.e., the idea that when governments do protect an infant industry, protection often lasts longer than necessary because the state gets captured by political interests benefiting from ‘senile’ industries. I know many people roll their eyes at the rent-seeking critique — and I do agree it’s overused to dogmatically reject reasonable theoretical cases for protection. But the rent-seeking argument is still valid. But I don’t think lumping the economic case for infant industry with the [political economy] problems has been conducive to the debate in the past. France [was] not competitive with Britain in cloth, but hard to see how they would have moved into factory based manufacturing so early otherwise. For developing countries I see this as the broader view on what some form of infant industry policy could achieve if done right”. Let’s call the distinction she makes the “purely econ angle” versus the “historical angle”. I agree it’s valuable to demonstrate the “purely econ angle” whilst ignoring the “historical angle”. And I acknowledge, so far in this post I’ve focused on the historical question of what eventually happened in France, not on the ahistorical, purely social-scientific issue of what is possible to do with the optimal “intelligent protectionism”. An ideal infant industry protection, if done right, would be truly temporary protection to provide that “breathing space” until industry achieves some measure of competitiveness, and no more. That is exactly what Juhasz’s paper shows is possible in principle: she manages to show that a discrete event [i.e., the Napoleonic blockade per se], independent of subsequent events, has certain long-term effects [i.e., France possessed a large cotton industry in 1850]. The paper is therefore part of the corpus of historical persistence studies relating some shock in the past with later outcomes. By the way, the heavily protected New England textile industry also never became internationally competitive. Even as late as 1904, with the effective rate of protection at 238% (Leunig 2003), unit manufacturing cost in Lancashire was still lower. Contrary to popular stereotype, mainstream economics does not a priori rule out things variously described as “infant industry protection” or “industrial policy”. Abundant theoretical rationales for such things can be found at the intersection of endogenous growth theory, strategic trade theory, and new economic geography. Everyone acknowledges that the spillover benefits (positive externalities) of technology are very large. If your country has a computer industry, this implies formal as well as tacit knowledge that’s embodied in people and organisations whose benefits spill outside that specific industry. So even the service sector benefits from the country’s ability to create PayPal or Just in Time inventory control. When you have positive externalities, the social return to producing some good exceeds the private return, and that’s a good thing for society, but it is a market failure which keeps the rate of investment lower than it could be. Private investors anticipate there is excess return which cannot be appropriated and they will undersupply that good. Hence, the question naturally arises whether the state should promote technology which might be expected to generate knowledge spillovers. Most people don’t object to subsidies for research and development. But many people do object if the promotion entails restrictions on international trade or direct subsidies to businesses. In the classic infant industry argument, a domestic industry is prevented by established, more efficient foreign producers with first-mover advantage from getting off the ground during the initial high-cost phase of production. Since you still need your factory, machinery, and work force in order to produce a single unit of output, the high fixed cost of merely starting up production can only be amortised by increasing the scale of production. Besides, even if the world’s cutting-edge technology and best practises drop from the sky onto your lap, these must still be adapted to local conditions. You learn to reduce costs and produce at frontier efficiency levels only by actually doing the production. This practical experience generates the techniques and improvements to production methods which are not easily codified and must reside in the brains of people — what in the Industrial Revolution literature is often called “tacit knowledge”, “micro-inventions”, and “local learning”. So firms in the start-up industry need “breathing room” to get up to speed. Otherwise they might get wiped out by foreign competitors before they’ve had the chance to mature. In this theoretical setup, temporary protection is justified since there’s latent comparative advantage to draw out. In the debate about antebellum US tariffs, it’s generally not about whether the New England cotton industry could have survived the full force of British competition. Rather the debate is between those who think it could have survived tariff-free after 1830 or after 1850. (cf. Irwin & Temin 2001 versus Harley 1992, 2001). David (1973) argued learning-by-doing effects were an important part of how and when New England became competitive, as production costs declined even without significant changes in machinery. Firms locate nearest their largest markets, their labour force, and their suppliers, but they also cluster amongst other firms like themselves. More of them there are in an industry, more knowledge is generated which cannot be contained within a single firm. Knowledge spills over, as skilled workers move between firms or set up their own shop; ideas and techniques are stolen and pirated; and firms simply demonstrate to one another what’s possible to do. It’s not only things like inventions which diffuse in the network of firms, but also all that practical experience and tacit knowledge. And then there are linkages aka “pecuniary externalities”. If the industry is bigger (for example, due to tariffs or subsidies), there is more specialisation in different value-added stages of production. During the Industrial Revolution, you could say a bigger cotton industry made it more likely to get more specialist machine makers, more specialist textile printers, more specialist weavers, etc. And all this lowers unit costs. By the way, I agree industrial policy should also pass the welfare test. But when it comes to development in poor countries, I don’t put much stock in static welfare considerations — people tend to be hyperbolic discounters and industrial policy should be seen as forced savings/investment for the really really really long haul. Their revealed preferences suggest they don’t care all that much about their descendants anyway! Hell, according to Banerjee and Duflo, even physically stunted and malnourished people often blow extra income on expensive festivals! It’s normal to want fun in the dreary here and now… So I prefer to examine industrial policy arguments for developing countries on the grounds of effectiveness of intervention as well as institutional & state capacity problems. And human capital. That’s quite neglected when it comes to industrial policy debates in LDCs. In the industrial policy literature connected with trade & development, there’s just way too much emphasis on skills & knowledge externalities generated by promoted industries, as opposed to the knowledge and skill created by formal schooling. This entry was posted in cotton, cotton textiles, France, import substitution industrialization, industrial policy, Industrial Revolution, Infant industry argument, protectionism, trade & development and tagged agglomeration, cotton, Infant industry argument, John Nye, Napoleonic blockade, Reka Juhasz, rent-seeking. Bookmark the permalink. Yes, Krugman in the mid-1980s did make a theoretical case for industrial policy and not just for developing countries like contemporary Korea, but in the policy debates around the rise of Japan he backed away from his findings t the extent that they could be construed to make the case for industrial policy in many oligopolistic industries in the developed world (if memory serves, the aircraft industry was a featured example). Nice. The blockage does present a beautiful laboratory in that the that the war itself wasn’t about trade and the blockade wasn’t specific to cotton or textiles. A magnum opus, as opposed to a really cool paper, might ask the same questions around a panel of industries. Was the blockade just good policy, in the sense that it played no favorites? If Napoleon had intended to protect only “infant industries”, would he have so identified cotton? I’m not surprised France lacked a competitive advantage in fabric production. Their big export has been fashion, at least since the 18th century, and it is still a big export today. Would it be worth protecting a fabric business to preserve the knowledge and flexibility driving a business where there is an advantage? Putting it differently, we might say that the French textile industry developed differently, more along the lines of luxury goods, since France lacked access to the overseas markets that made commodity cottons such a boon to the British. And so we see the Jacquard loom in 1801: great for brocades, not much use for calicoes. since France lacked access to the overseas markets that made commodity cottons such a boon to the British. I disagree that’s the reason for France, because, while what you say is true for Britain, it’s misleading. But you will have to wait for my next post. Will wait impatiently. I don’t really have a theory to defend here – beyond the thought that in the mix of “global context” and “domestic economic conditions” (viz. your Bairoch post), scale is one of those things that matter. Re Juhasz’s figure 4. This seems to show the disappearance of the cotton industry in Alsace, concentrated round Mulhouse, between 1840 and 1887. Of course, what happened was that Alsace became part of the Second Reich between 1871 and 1918. Yes, Mulhouse the “French Manchester” went to Germany in 1871. She doesn’t intend to mislead. The point of the map anyway is to show the move from south to north. Is there a word missing between “industry” and “in 1860”? Seems like there is.